"Raspberry-lemon sorbet is a refreshing treat on a summer day." Stir boiling water into dry gelatin mix in large freezer proof bowl at least 2 min. until gelatin is completely dissolved. Stir in frozen lemonade concentrate. Refrigerate 15 min. or until slightly thickened (consistency of unbeaten egg whites). Mash raspberries with fork. Add to gelatin mixture along with whipped topping; stir with wire whisk until well blended, Cover. Freeze 4 hours or until solid. Remove from freezer 15 min. before serving. Let stand at room temperature to soften slightly. 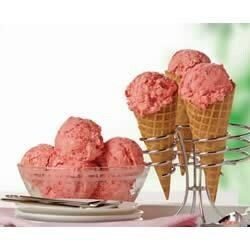 Scoop into cones or dessert dishes. Store any leftover dessert in freezer container in freezer. Chef John: "You'll just have to trust me on this." I have made it 10 times and every time i made it, it always so good! Very easy. We always have the ingredients for this. Last time we used sugar-free and Splenda so my mother-in-law could have some with us and it was so good too. Super easy to make and very tasty. My raspberries were a bit sour, so next time I may add sugar the the berries before mashing them, or add extra cool whip. Not as good as hoped. It was a little too strong. i'll be tweaking! This is so super tasty and so easy! If raspberries weren't so expensive, I'd make this every week! YUM!